This past Thanksgiving weekend a dear friend of mine got married, at my house! I've been planning and decorating this wedding in my head for months and now I can't believe it's over. 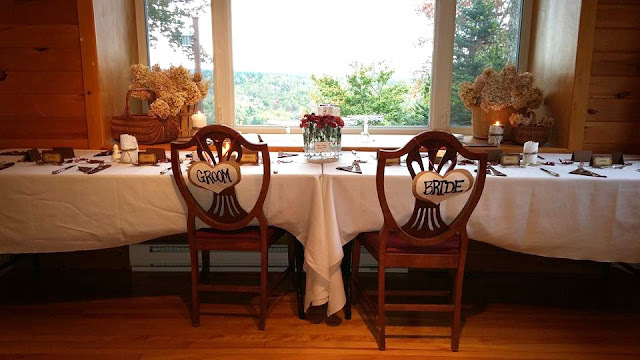 The maid of honour whipped up these "Bride & Groom" signs the night before the ceremony. We went with a rustic, simple decor to fit with the simple back deck ceremony. 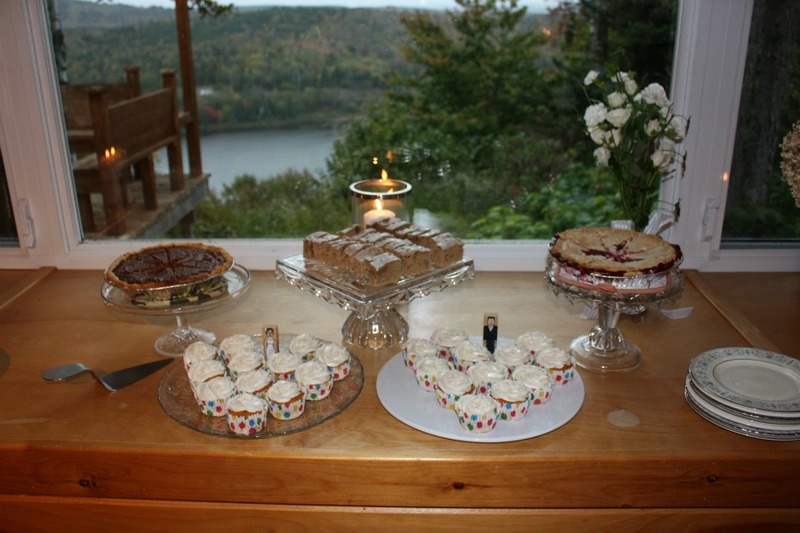 The reception to follow was also at my house and it was a lovely Thanksgiving family meal. 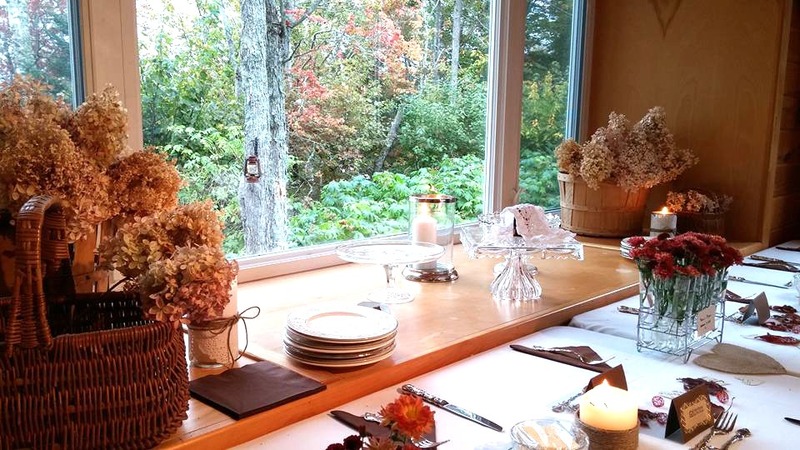 In case of rain, we had the tables pushed against the window to make room for guests inside, but it turned out the rain held off...just enough! Baskets of flowers and a mix of tin cans and mason jars wrapped in paper doilies and twine made up most of the decor. I'd like to thank my hydrangea tree for giving up almost all of her blossoms. 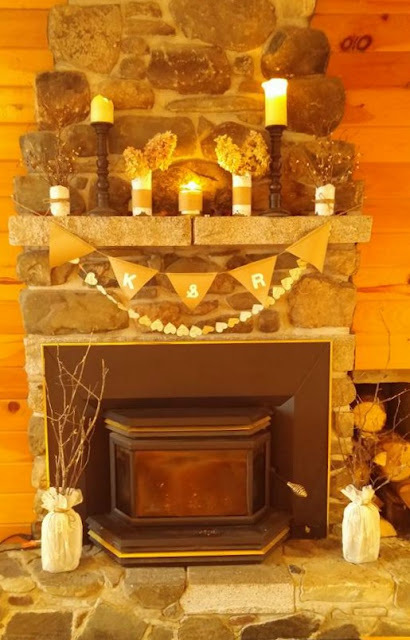 Our fireplace had a strand of paper hearts and craft paper bunting. 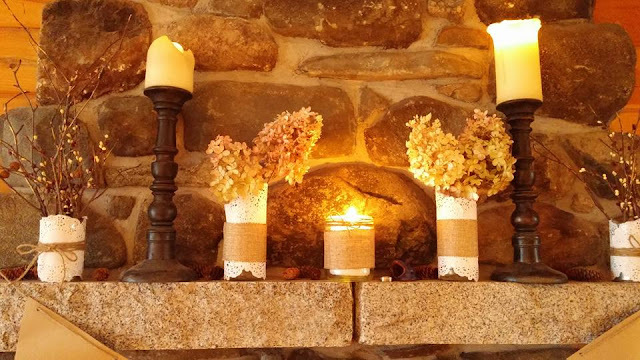 inside scoop: that center candle is in a glass Tostitos salsa jar wrapped in burlap ribbon! The blue frog ring holder was the bride's aunts, who is no longer with us. I found old, glass milk bottles and covered them with scraps of lace curtain. add some branches, et voila! We made really simple place cards with just card board and cute labels. 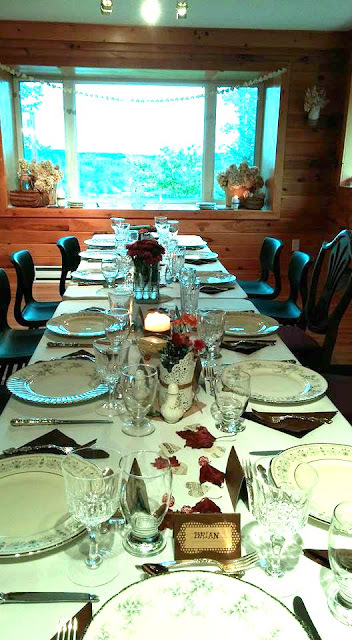 all set and ready to be filled with Thanksgiving dinner! 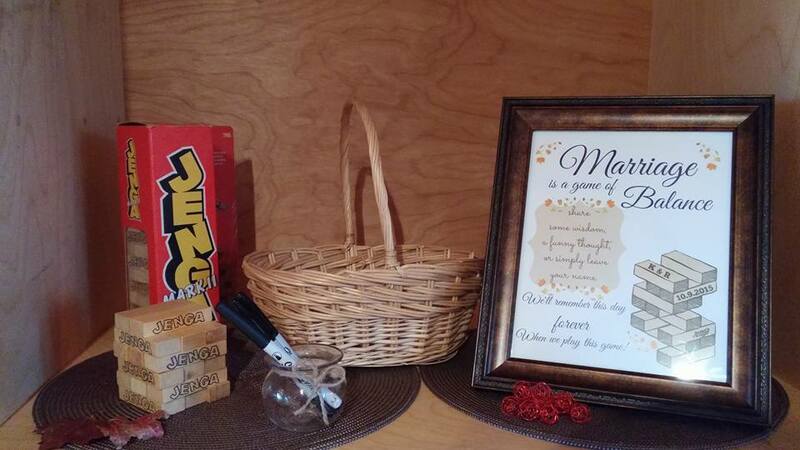 The bride and groom meet playing board games, so they decided to do a Jenga block guestbook to celebrate that. 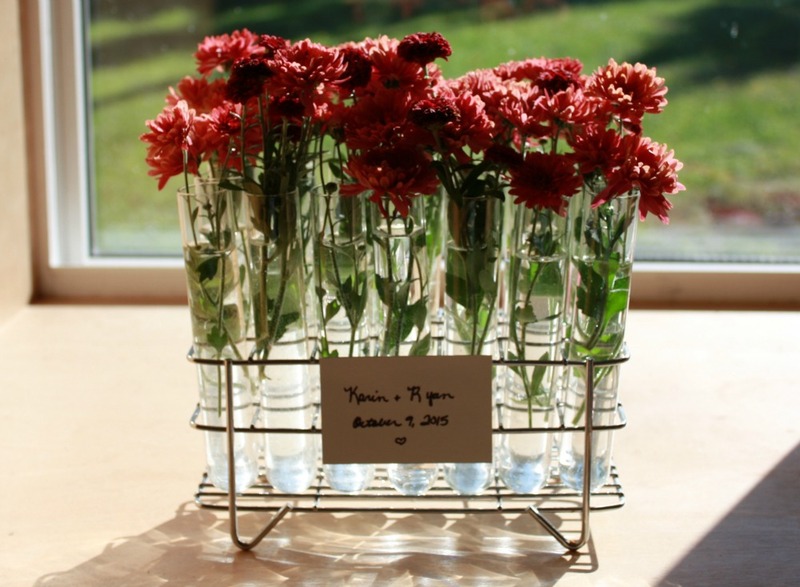 I was super excited to use my test tube Dean & Delucca spice rack as a flower holder. 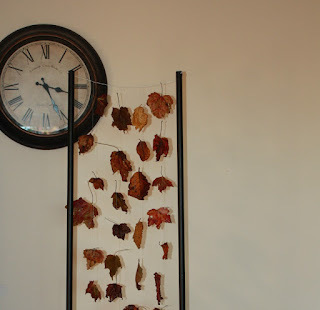 I made a wall of floating leaves with more of the waxed leaves. I found these two prints and covered them with old doilies using a spray adhesive. 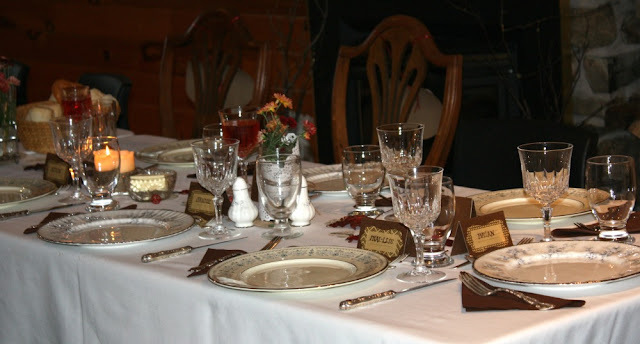 Then I used them as a backdrop in my little china cabinet behind all the teacups. this pattern is called Bride's Choice. how perfect. I feel in love with this heart swag - I may keep it up all the time! Hot Tip: tuna cans are the perfect circumference of large pillar candles. 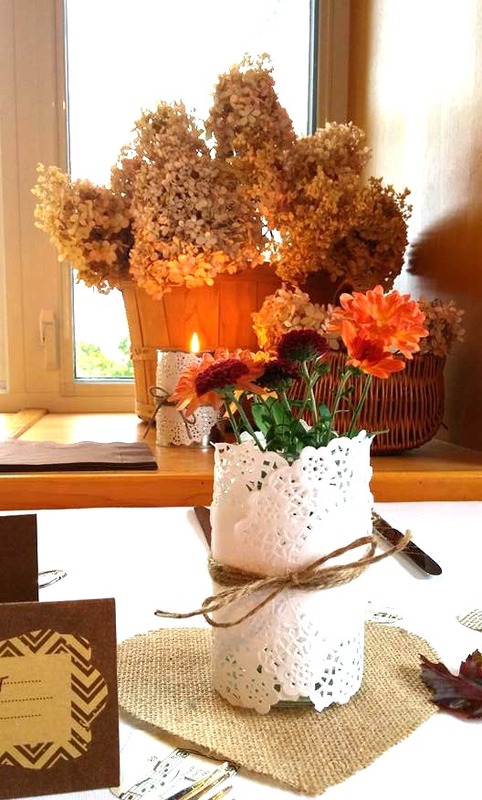 Use a little hot glue and twine and who is to know! 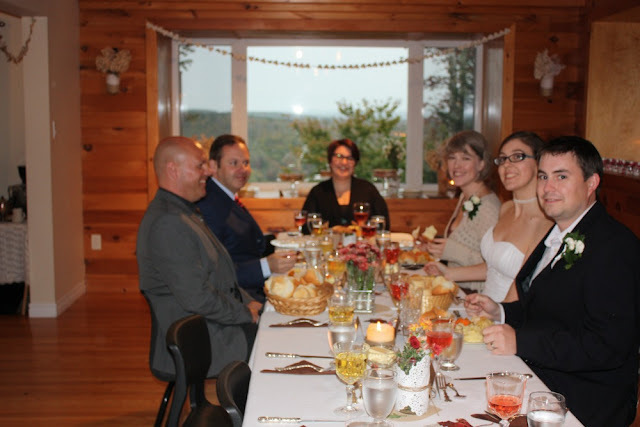 The happy couple and some of the guests! Super amazing wedding décor. 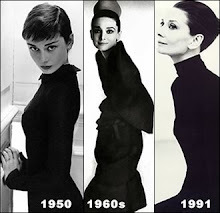 I am just in love with each and everything that has been shown here. My sister will be marrying in the next month and she has also booked one of the indoor wedding venues in LA and these inspirations would be extremely helpful for her.